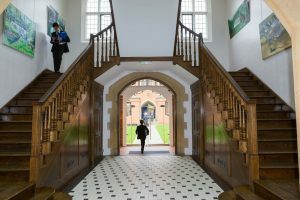 While most parts of the School would be unrecognisable to a visitor from the opening day in 1865, one part remains unchanged and that is the main stairs up into what is now East by the black and whites. The Surrey Advertiser of Saturday October 14 gave a detailed description of the ‘new buildings’ noting that on passing the school rooms (now the library and Reading Room) “there are staircases left and right leading to the dormitories”. Initially, there were four dormitories (1 South, 2 South, 3 South and 4 South) accessed via these stairs and it remained this way until the opening of the Connaught Block in 1929 when 2&3 South and 1&4 South (as they had become) moved there and East expanded into the vacated space where they have remained since. The highly polished stairs are original and as such probably, along with the large front doors, the oldest parts of the School unchanged since it opened and still in daily use.